A permanent resident in forested areas and human settlements. The Black-capped Chickadee was abundant during the Minnesota Breeding Bird Atlas (MNBBA). The Black-capped Chickadee is widely distributed across the forested areas of the midwestern and northern regions of the United States and throughout the forested regions of Canada and south in the Rockies to northern New Mexico. The highest densities are in the northeastern and upper midwestern United States and Canada (Figure 1). Permanent resident, but erratic, short-distance migrations occur. Omnivore; largely insects, spiders, seeds, and berries gleaned from foliage or feeders. Cavity nester in trees; often self-excavated in a natural cavity; occasionally a nest box or a cavity excavated by a woodpecker. Breeding distribution and relative abundance of the Black-capped Chickadee in North America based on the federal Breeding Bird Survey from 2011 to 2015 (Sauer et al. 2017). The Black-capped Chickadee was described by Roberts (1932) as a “common permanent resident throughout the state.” He included limited but wide-ranging confirmed nesting from many areas of the state, from the extreme northeastern regions in Cook County, to Houston County in the southeast, plus many counties throughout the forested regions of Minnesota. Forty years later, Green and Janssen (1975) did not include a map of confirmed breeding observations but simply stated it was “breeding throughout the state.” Janssen (1987) also described the Black-capped Chickadee as a “common to abundant permanent resident breeding throughout the state.” He included a breeding distribution map with confirmed nesting documented in 44 of the 87 counties, all of which were widely distributed throughout Minnesota. A few years later, Hertzel and Janssen (1998) added another 7 counties to the list of confirmed nesting in Minnesota since 1970. The Minnesota Biological Survey included 1,502 records of breeding season locations, all of which were broadly distributed throughout the surveyed counties (Minnesota Department of Natural Resources 2016). However, no breeding locations were included from two western counties, Big Stone and Wilkin. The MNBBA reported 5,646 breeding records from every county in the state (Figure 2). Breeding detections were recorded in 57.3% of the 4,756 blocks with coverage, including confirmed nesting in 603 blocks (Figure 3; Table 1). Nesting was confirmed in 90% (78/87) of the counties in the state. The only counties where nesting was not confirmed were Big Stone, Faribault, Grant, Lincoln, Martin, Redwood, Rock, Traverse, and Watonwan; all are located in the southwestern part of the state. Probable nesting was observed in all of these counties, except these three: Lincoln, Redwood, and Traverse. Confirmed nesting activity was particularly dense in areas with the most intense coverage, such as in the Twin Cities and Brainerd areas. The MNBBA probability map exemplified the wide distribution of the Black-capped Chickadee throughout Minnesota (Figure 4). The highest densities were predicted in the urban and suburban areas of the Twin Cities and other populated areas, such as the lakes region around Brainerd. Lower densities were predicted in the southwestern and western portions of the state where there are fewer trees as well as in many of the bog areas where trees are often too small and unsuitable for nest sites. However, Black-capped Chickadee occur in riparian areas, urban areas, and woodlots throughout the state. Because this species nests in trees, it is difficult to comprehend that loss of forested habitat in Minnesota over the past 150 years has not had a negative effect on its population. However, its commonness and the lack of comparable monitoring data from the 1800s or early 1900s render it impossible to gauge whether any change has occurred. The Black-capped Chickadee has adapted well to human-dominated landscapes, and its fondness for bird feeders may have mitigated any possible negative effects from the reduced number of trees in the state. Breeding distribution of the Black-capped Chickadee in Minnesota based on the Breeding Bird Atlas (2009 – 2013). Summary statistics of observations by breeding status category for the Black-capped Chickadee in Minnesota based on all blocks (each 5 km x 5 km) surveyed during the Breeding Bird Atlas (2009-2013). Summary statistics for the Black-capped Chickadee observations by breeding status category for all blocks and priority blocks (each 5 km x 5 km) surveyed during the Minnesota Breeding Bird Atlas (2009-2013). Predicted breeding distribution (pairs per 40 hectares) of the Black-capped Chickadee in Minnesota based on habitat, landscape context, and climate data gathered during the Minnesota Breeding Bird Atlas (2009-2013) using the General Linear Modeling method with an adjustment for detectability. The Black-capped Chickadee uses a wide variety of habitats, including mixed deciduous-coniferous forests, open woods and parks, suburban areas, and woodland edges (Figure 5). It is highly tolerant of forest fragments (Smith 1991; Foote et al. 2010). Its habitat profile, gathered during the random point counts of the MNBBA, reinforced its wide habitat use with detections in almost all habitat types except in open habitats without trees such as croplands, marsh/wet meadows, and upland grasslands (Figure 6). Based on almost 5,000 observations, the National Forest Bird (NFB) Monitoring program (Niemi et al. 2016) indicated primary use of urban areas (particularly small towns) but equal use of all other forest types, except treeless open areas such as sedge meadows. These forest cover types included deciduous forests, mixed deciduous-coniferous forests, lowland deciduous and coniferous forests, and recently logged forests, as long as some live and dead trees remain in these areas. Typical breeding habitat of the Black-capped Chickadee in Minnesota (© Gerald J. Niemi). Habitat profile for the Black-capped Chickadee based on habitats within 200 m of point counts where the species was present during the Minnesota Breeding Bird Atlas (2009-2013). Partners in Flight estimated a North American breeding population of 39 million breeding adults (Rosenberg et al. 2016). However, an earlier version estimated a Minnesota breeding population of 1.1 million (Partners in Flight Science Committee 2013). The MNBBA estimated a breeding population of twice that number, or approximately 1.98 million breeding adults (95% confidence interval of 1.80 – 2.35 million). The federal Breeding Bird Survey (BBS) trend for Minnesota has been highly variable, but the Black-capped Chickadee population has been significantly increasing from 1967 to 2015 by 2.53% per year (Figure 7). This significant population trend is also consistent with trends in Michigan, Ontario, and Wisconsin. The population in Manitoba has only been stable over this same time frame. Based on the BBS, Partners in Flight (Rosenberg et al. 2016) estimated an overall 40% increase in its North American population from 1970 to 2014. However, an examination of the population trends across North America based on the BBS from 1966 to 2015 illustrates a very complex pattern (Figure 8). Overall, Black-capped Chickadees are generally increasing in the northeastern United States, where its overall population densities are highest. Yet vast areas in the western United States and Canada have declining populations but also regional pockets of increasing populations. In Minnesota, most of the state has an increasing population consistent with its overall trend, except for a portion of the northwest. The combined Chippewa and Superior National Forest data from the NFB program indicated a stable breeding population from 1995 to 2016 (Figure 9). The populations has been trending downward slightly from 2004 to 2016. 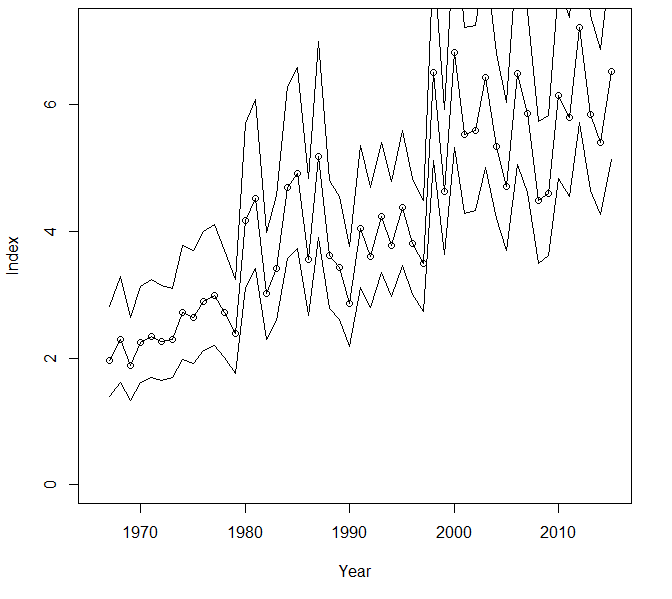 This recent decline has corresponded with a stabilization in the BBS trends in Minnesota for the Black-capped Chickadee since the late 1990s (Figure 7). Mean population density estimates in the Superior and Chippewa National Forests ranged from 1.6 to 2.3 pairs/40 ha, respectively. These data support the higher densities in the north-central region of the state compared with the northeastern region. Within specific forest cover types, highest mean densities of 3.2 and 3.5 pairs/40 ha were observed in mixed swamp conifer and red pine forests, respectively, in the Chippewa National Forest. Typical mean densities in mixed aspen and white or jack pine forest cover types in both the Chippewa and Superior National Forests varied from 1.1 to 2.5 pairs/40 ha. Breeding population trend for the Black-capped Chickadee in Minnesota for 1967–2015 based on the federal Breeding Bird Survey (Sauer et al. 2017). Population trend map for the Black-capped Chickadee in North America for 1966–2015 based on the federal Breeding Bird Survey (Sauer et al. 2017). 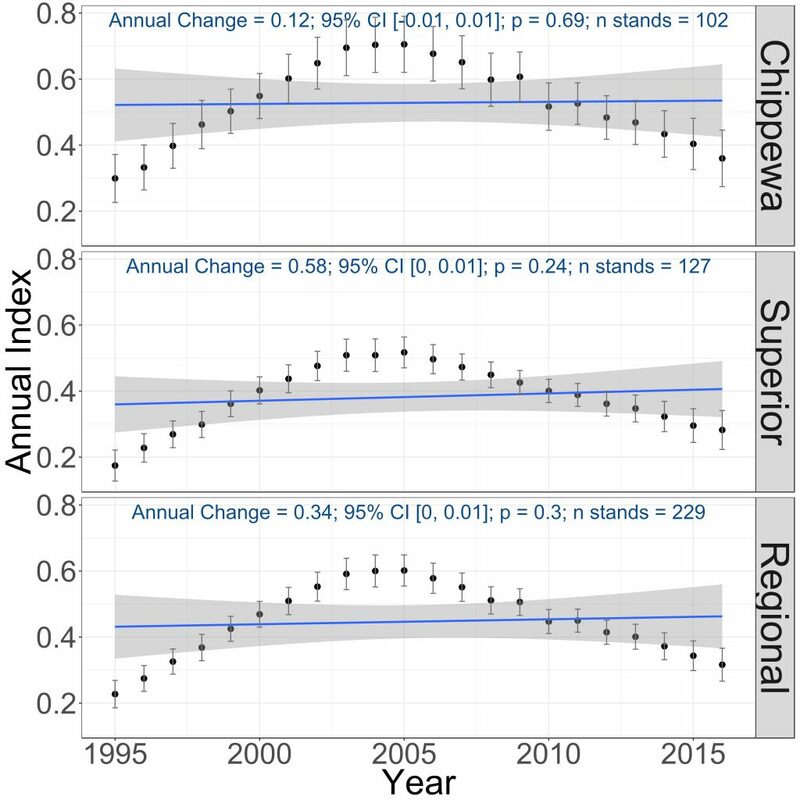 Breeding population trends of the Black-capped Chickadee in the Chippewa and Superior National Forests and the combined regional trend, 1995–2016 (Bednar et al. 2016). Overall, the Black-capped Chickadee has received little attention directed toward conservation efforts because of its healthy and generally increasing population status. It also has a low Continental Concern score of 7/20 from Partners in Flight (Rosenberg et al. 2016). Its declining regional populations, especially in the western United States and Canada, are worthy of continued observation. Black-capped Chickadee populations greatly benefit from food supplied by bird feeders, especially during the winter months (Desrochers et al. 1988; Brittingham and Temple 1988). Recent increases in the cost of birdseed and potential decreases in bird feeding may be related to some of the recent declines observed in this species. The availability of suitable nesting cavities is an ongoing concern for any species that primarily excavates its own cavity. This is especially true for the Black-capped Chickadee, which does not have the anatomical apparatus of a woodpecker to excavate cavities in solid wood. Chickadees must rely on damaged trees or decaying wood to satisfactorily excavate a suitable cavity, so maintaining such trees (e.g., dead snags or partially rotted trees) is an important aspect of forest management. As identified by Foote et al. (2010) “overzealous” forest management that reduces or eliminates natural nest sites can be detrimental to the species. In their analysis of species susceptible to climate change, Langham et al. (2015) and the National Audubon Society (2015) did not identify the Black-capped Chickadee as a species of concern. Milder winters could benefit this species by increasing overwinter survival, one of the major factors contributing to its mortality. Brittingham, Margaret Clark, and Stanley A. Temple. 1988. “Impacts of Supplemental Feeding on Survival Rates of Black-capped Chickadees.” Ecology 69: 581–589. Desrochers, André, Susan J. Hannon, and Kelly E. Nordin. 1988. “Winter Survival and Territory Acquisition in a Northern Population of Black-capped Chickadees.” Auk 105: 727–736. Smith, Susan M. 1991. The Black-capped Chickadee: Behavioral Ecology and Natural History. Ithaca: Comstock Publishing of Cornell University Press.